Scattered showers, mainly after midnight. Partly cloudy, with a low around 66. Southeast wind around 6 mph. Chance of precipitation is 40%. Showers likely, mainly before noon. Partly sunny, with a high near 85. East northeast wind 7 to 13 mph. 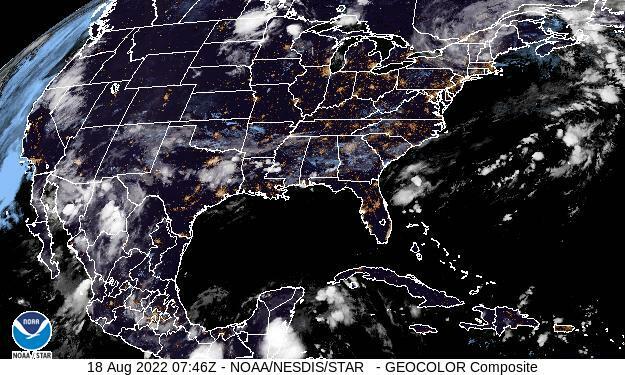 Chance of precipitation is 70%. 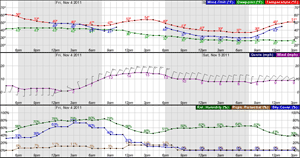 New precipitation amounts between a quarter and half of an inch possible. Isolated showers. Mostly clear, with a low around 65. East northeast wind around 5 mph becoming light and variable in the evening. Chance of precipitation is 20%. Scattered showers, mainly after noon. Mostly sunny, with a high near 88. East wind 7 to 10 mph. Chance of precipitation is 40%. Isolated showers. Mostly clear, with a low around 67. East wind around 6 mph becoming light and variable after midnight. Chance of precipitation is 20%. Scattered showers, mainly after noon. Mostly sunny, with a high near 88. East northeast wind 5 to 9 mph. Chance of precipitation is 30%. Mostly clear, with a low around 67. East wind 3 to 6 mph. Sunny, with a high near 87. East wind 7 to 9 mph. Scattered showers. Mostly sunny, with a high near 89. Chance of precipitation is 50%. Scattered showers. Mostly cloudy, with a low around 68. Chance of precipitation is 50%. Scattered showers. Partly sunny, with a high near 90. Chance of precipitation is 30%.